When looking for RDAs, you’re faced with tons of options. Depending on what you’re looking for will determine which RDA best fits your needs. A question that is often asked is what is the best rebuildable dripping atomizer of all. While there’s no straight forward answer, we have compiled this list of our favorite atomizers for flavor and more! 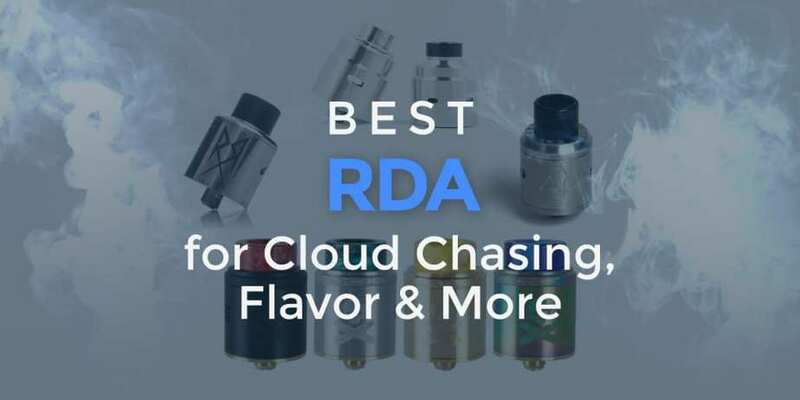 In this article, you will see new RDAs, and some of the top RDAs based upon our experience and ratings across the board from Vaping Cheap and the vape community. If your confused about all the RBA acronyms, check out our RBA vs RDA vs RTA guide. 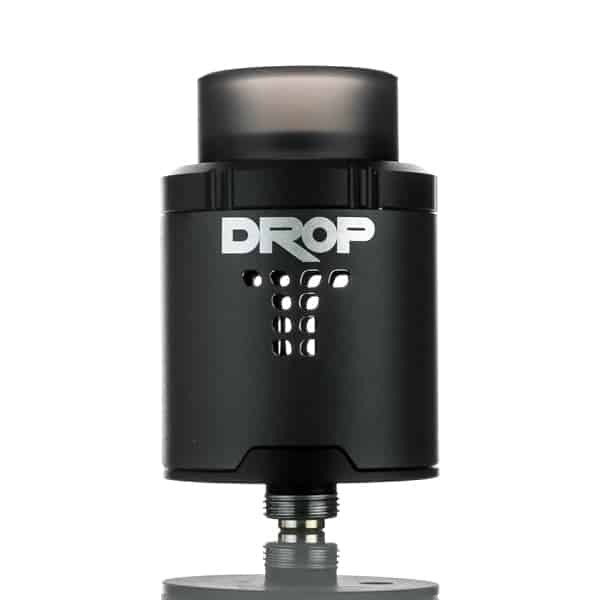 The Drop Dead RDA is a collaboration between Hellvape, Heathen and The Vapor Chronicles. The company flourished after the release of the Dead Rabbit RDA and now they’ve made this new rendition. This atomizer does include a wide bore resin drip tip, a wide bore clear drip tip and a 510 drip tip adapter, allowing you to use all of your favorite custom drip tips. 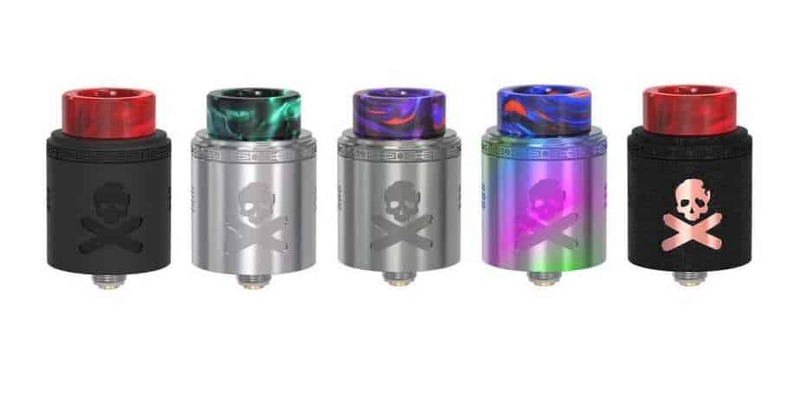 The Hellvape Drop Dead RDA has a few key notable characteristics such as the 4 post build deck. This build deck supports both a single coil and a dual coil build, giving you not one, but multiple build options. 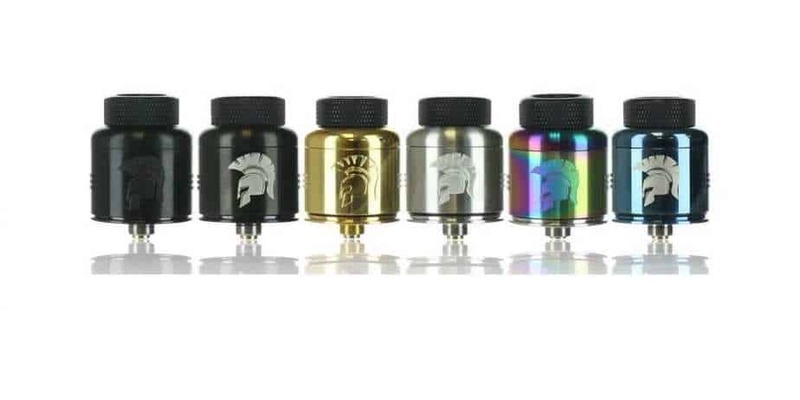 This RDA also has a top airflow design, which can be easily adjusted thanks to the knurled top cap design. Overall, the Hellvape Drop Dead RDA was one of the best of last year and was highly sought after in 2018. This RDA took the designs of two successful atomizers, the Drop RDA and Dead Rabbit RDA and improved them, giving you the best of both worlds. The DotMod DotRDA 22mm is the newest atomizer to be released by the popular company DotMod. This compact flavor chasing atomizer has an overall diameter of 22mm and includes both an ultem beauty ring and clear frosted top cap. The DotMod DotRDA 22mm has a postless build deck, and a tool is included which allows for an easier coil install. What makes this atomizer stand out from the rest is the slanted airflow design not is it easy to adjust but gives a whirlwind of flavor. There is a signature gold engraved logo of the company name on the side, just like all the other DotMod products. The DotMod DotRDA 22mm is another amazing dripper from DotMod. The flavor is hard to beat when comparing it to other single coil atomizers. Even though this is not the cheapest atomizer on the market, the quality and performance is there. If you’re a fan of low profile RDAs, then you don’t want to miss out on this one. With its compact form factor, and flavor oriented airflow design, you’ll only be experiencing flavorful clouds every time you take a vape! When speaking about the best cloud chasing RDA, the new 528 Customs Goon 25mm RDA is almost always mentioned at the top of the list. This is sometimes even mentioned as the top atomizer on the market due to its innovative design and flawless performance. 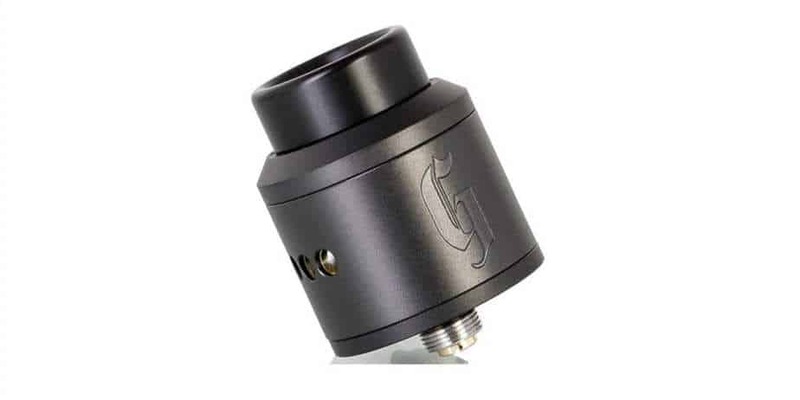 The original Goon RDA is the atomizer that brought you the clamp style build deck which many other atomizers are using today. This style of build deck is easy to build on, and allows you to fit massive coils without much issue. The airflow on this dripper is fully adjustable, and it does support single coil builds. There are 3 airflow holes on each side just like the original, and we prefer this atomizer with only 2 airflow holes. We find this allows for a near perfect draw when cloud chasing. However, if you wanted massive amounts of airflow to cool down your larger coil builds, having this RDA fully open will deliver. The 528 Customs Goon RDA does feature a gold plated 510 contact, which allows for excellent conductivity, and it is hybrid safe, which is perfect for you cloud chasers. Overall, the 528 Customs Goon 25mm RDA can be seen as one of the leading atomizers on the market today. If you're looking to cloud chase, but still get some great flavor, then this is one RDA you should highly consider. If you're interested in reading our full thoughts, you can find the review for the 22mm version right here. The Recoil Rebel RDA is brought to you by popular YouTuber Grimm Green and coil builder Ohm Boy OC. This RDA features a unique build deck with stack staggered posts, which make coil installs a breeze. The build deck itself 22mm, so you do have room for larger coil builds such as Fused Claptons, Aliens and more. The gold plated 510 contact is perfect for conductivity, and essential when looking for an RDA for clouds. What's great about the Recoil RDA is that it comes with two caps, one being featuring the traditional snake bite airflow and the other more tuned for cloud chasing with four massive airflow holes. 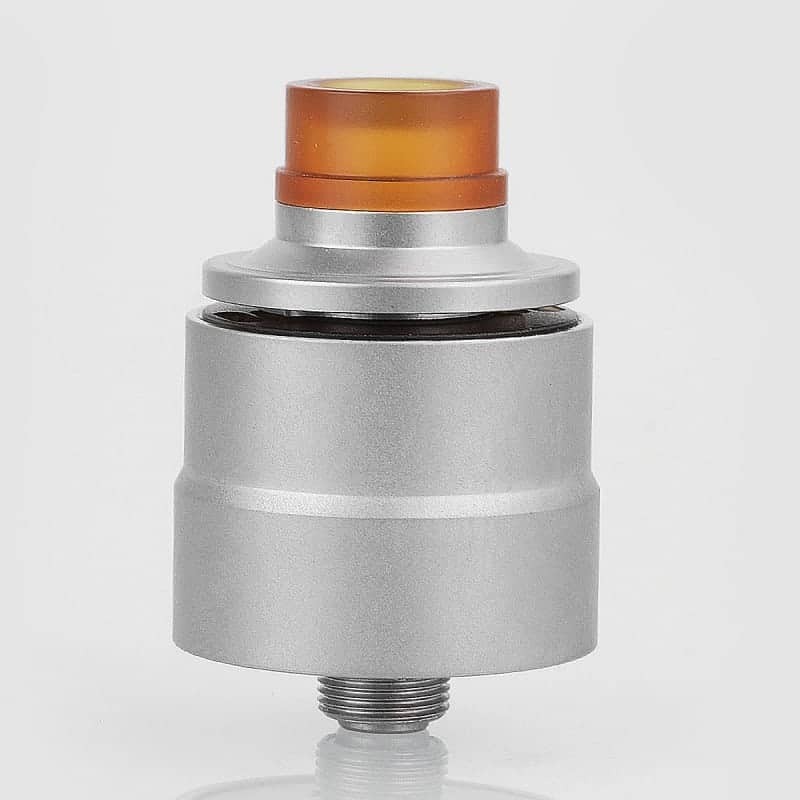 So if you wanted to use this atomizer as a flavor RDA, you surely can with the snakebite airflow cap. However, for you cloud chasers, you definitely want to be using the other cap, as it does provide a bit more airflow, which is yet again essential for cloud chasing. You can check out our first impressions of the original Recoil right here which does feature the snakebite airflow design. Overall, the Recoil by Grimm Green x Ohm Boy OC is an excellent performing RDA. With all the extras included, you do get a lot of value for the money. In our opinion, this can easily be one of the best atomizers on the market since it does include two unique top caps, where you can flavor chase or cloud chase with a single atomizer! Here’s another collaboration, this time between Wotofo and JMT elite. The Warrior RDA is a large 25mm atomizer and has a domed top cap, which is known to provide better flavor production. It is made out of a durable stainless steel material and comes in multiple eye appealing colors. The wide bore 810 drip tip is great for dripping without taking off the top cap. The Wotofo Warrior RDAs biggest strength is the dual post clamp style build deck, making it perfect for your larger coil builds such as Fused Claptons, Aliens and more. The beehive style airflow keeps the atomizer cool alongside delivering a smooth draw. It can be adjusted by simply turning the top cap. You can also squonk with this dual coil atomizer as it does come with a BF pin. Overall, the Warrior RDA by Wotofo and JMT Elite has great qualities making it a solid looking and performing atomizer. If you are looking for a new atomizer that can fit large coil builds with ease, then the Warrior RDA is one to add to your collection. The Vandy Vape Bonza RDA V1.5 is a collaboration between popular YouTuber The Vaping Bogan and Vandy Vape. The primary reason as to why this is great for large coil builds is its deck design which utilizes both a clamp and a standard post hole. With this design, it makes it easy to install your longer series coil builds and best of all, you won’t be twisting or bending your coil leads. The Bonza V1.5 RDA also features a stepped airflow design with 15 air holes on each side just like the original, giving you not only a smooth draw, but tons of available airflow allowing you to easily cool down hotter coils. However, with this new updated version, it allows for even more customization when it comes to airflow and it also has a top cap locking system. This atomizer is compatible with both 810 drip tips and 510 drip tips using the included 510 drip tip adapter. If squonking is your preferred way to vape, the Bonza also includes a Squonk or Bottom Feed 510 pin, allowing you to use it with your favorite squonk mods. All in all, the Bonza RDA by Vandy Vape and the Vaping Bogan is easily one of the best choices available today for your large coil builds. You can tell just by looking that this RDA was designed to easily accommodate such coils with ease. What’s even better is that this is also one of the more affordable options as well! The Baron RDA is the most recent Geekvape RDA and a great beginner RDA. A few reasons as to why this atomizer is considered great for beginners is because it has a dual post single coil build deck with a juice flow splitter in the center. There is a deep juice well allowing you to add more cotton and drip more e-liquid. The Geekvape Baron RDA has an external locking top cap which ensures the airflow is in the perfect position. Another feature is the multifunctional airflow control system, one is a honeycomb design and one is a slotted design, giving you multiple vape experiences. The Baron RDA is constructed out of 304 stainless steel material, includes 2 wide bore 810 drip tips and a 510 drip tip adapter. 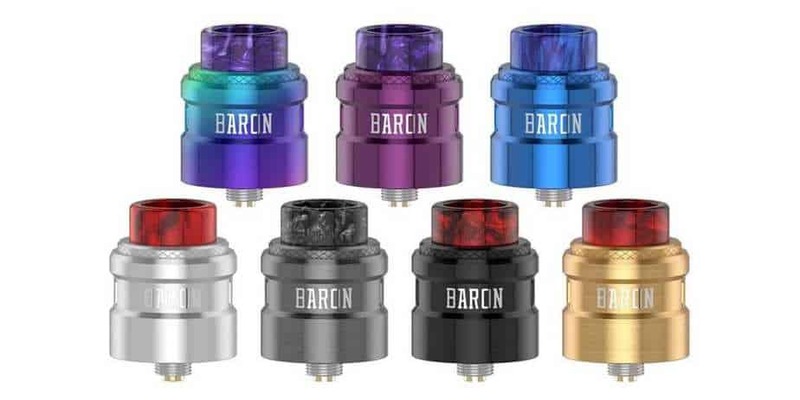 The Baron RDA is a solid atomizer for a vaper looking to get into building their own atomizer. It has an extremely easy to build on deck and includes a pair of coils and cotton, so you have everything you need to get started. The top cap is domed on the inside as well, which translates into richer flavor. Vapefly has had a ton of great releases from the Galaxies line atomizers and Wormhole atomizer to their recent RDA the Pixie BF RDA. This RDA has a simple yet modern design, making it eye appealing, but not too flashy. What makes this atomizer so favored is the ease of building. Firstly, there is the dual post design, which makes it quick to build on. Next, there are notches on the sides of the atomizer, which holds your tool in place while you fasten the coil. The Pixie RDA also has an interchangeable airflow system, which is great for those who prefer a more loose or tighter draw. Overall, the Vapefly Pixie BF RDA is a great single coil atomizer for beginners and advanced vapers. 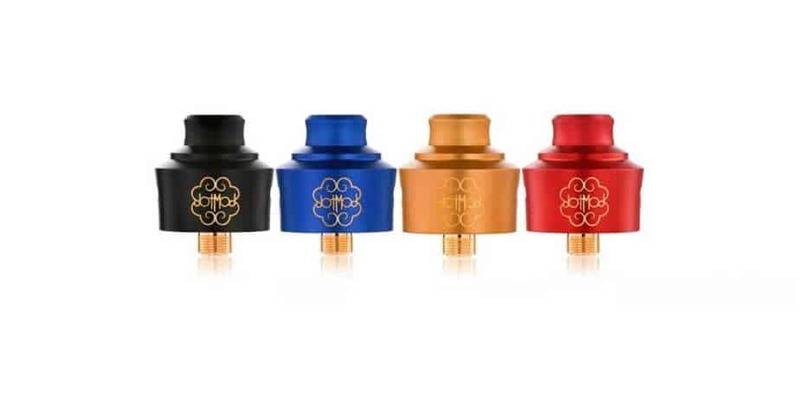 If you enjoy squonking this atomizer does come with a gold plated squonk pin. So if you’re looking for an affordable yet solid performing single coil RDA, then the Pixie is certainly one worth keeping your eye on. The Oumier Wasp Nano is not the newest atomizer, but it certainly is one of the best single coil RDAs especially when you consider its unbelievable performance and price point. It features a simple two post build deck which is seen on many single coil atomizers, so installing your coil is quick and easy. 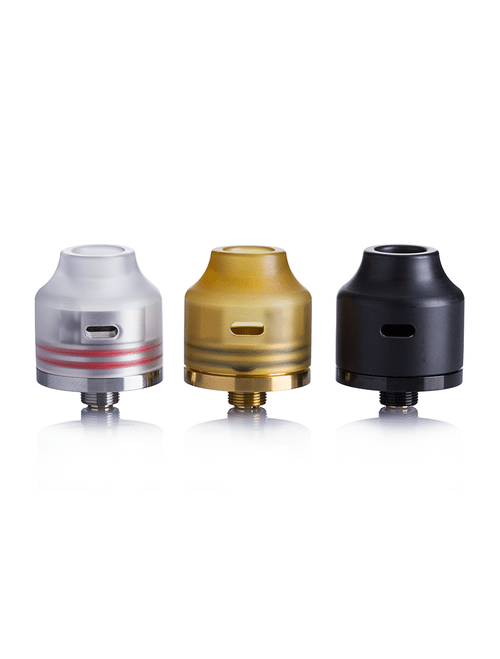 What’s great about the Wasp Nano is that it’s available in various colors such as black, Ultem, White and even Resin. It does include a squonk 510 pin which allows you to use this atomizer on all of your favorite squonk vape mods. 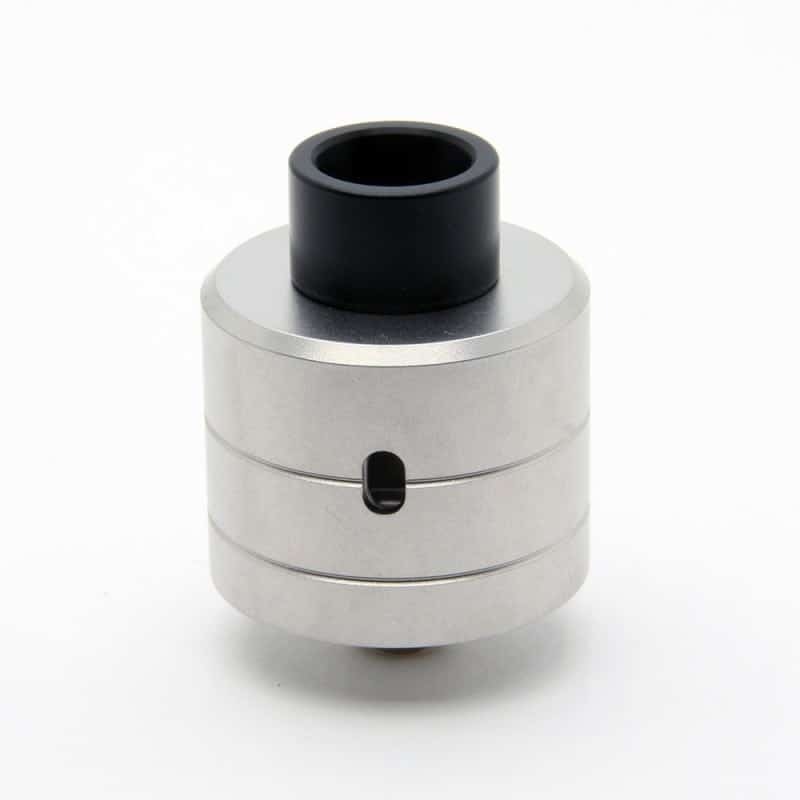 The Wasp Nano also features fully adjustable side airflow, and is compatible with 510 drip tips. The Wasp Nano RDA by Oumier is one of our favorites at Vaping Cheap and for good reason! 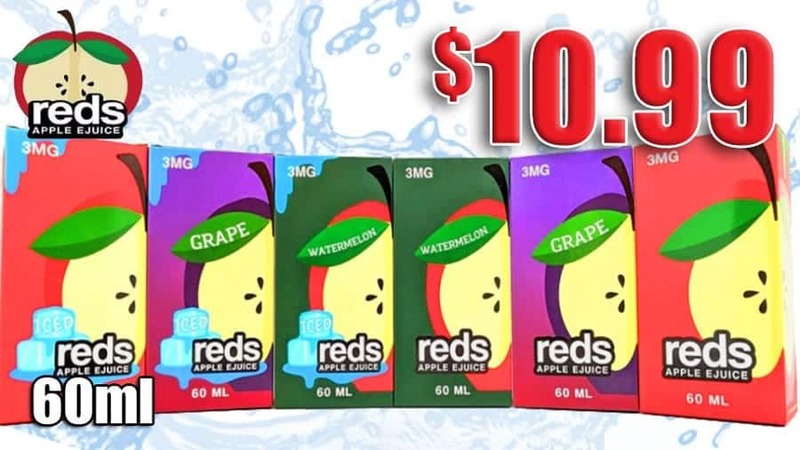 It’s simple, easy to use and can be found for under $15! If you’re a fan of single coil RDAs, this one is a must for your arsenal. Wotofo had many products introduced to us in the past two years and the Profile RDA is one of them that really sticks out above the rest. This atomizer is a collaboration between Wotofo and MrJustRight1 and has a diameter of 24mm. 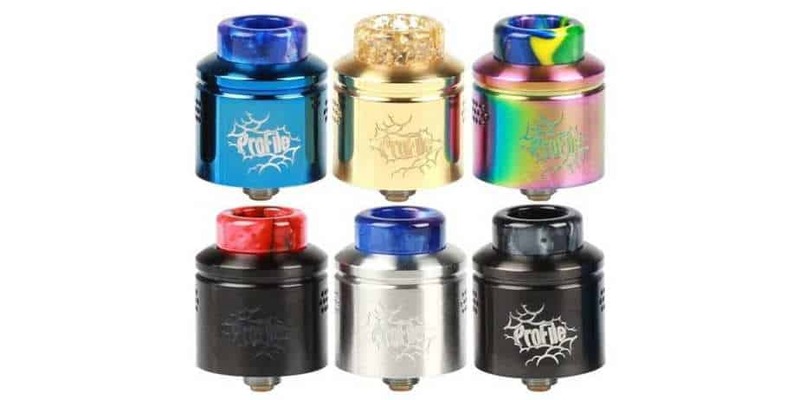 The Profile RDA peaked the interest in others with its unique build deck, as it supports both mesh coils and standard wire coils. The build deck on this RDA is dual post clamp system, but it has a spring loaded ceramic block which helps the cotton stay in place, which is perfect for mesh builds. You do receive a coil bending tool to help insert the mesh coils, which is a nice added bonus. The airflow is angled to the coil, giving you the best flavor possible. The Profile RDA is an excellent atomizer made by Wotofo and MrJustRight1. The fact it supports both mesh coils and utilizes a spring loaded ceramic block to keep the cotton still, makes it unparalleled when compared to others. If you want to learn more, be sure to check out our Wotofo Profile RDA Review. 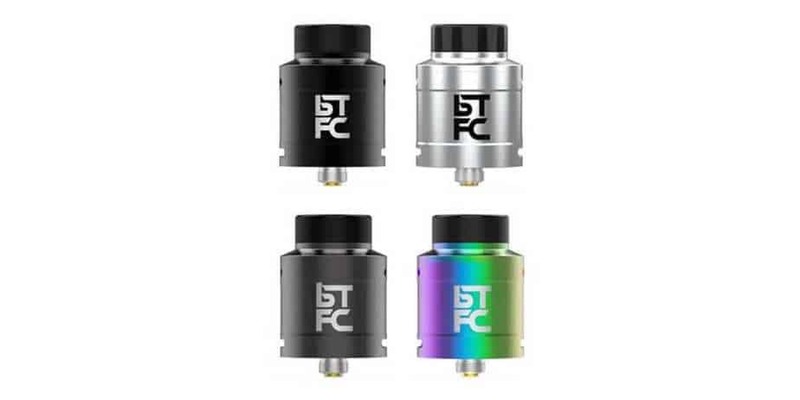 The Augvape BTFC RDA is a large atomizer that sports a diameter of 25mm. It has a curved dual post build deck and can fit larger sized coils. There are two airflow inserts one at the top and one at the bottom of the atomizer, and they are both fully adjustable. The BTFC RDA is a collaborative effort between Augvape and VapnFagn. This RDA includes a wide bore 810 delrin drip tip and a wide bore 810 acrylic drip tip. The name of this atomizer is an acronym meaning Bottom Airflow, Top Airflow, Flavor Chasing and Cloud Chasing. 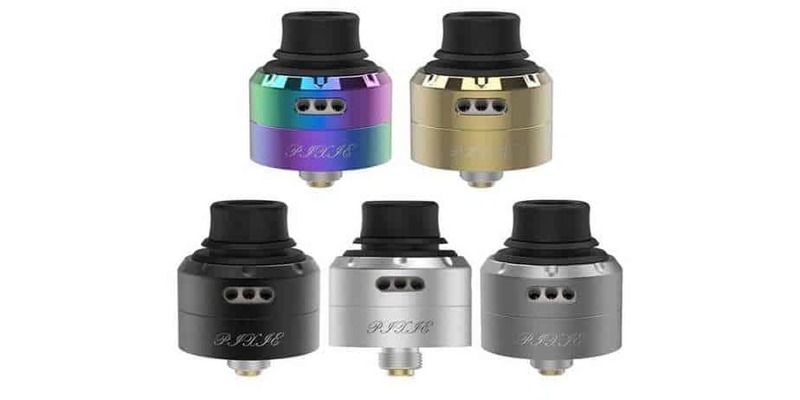 Overall, the Augvape BTFC RDA is an atomizer that differentiates itself in many ways. There is a deep juice well allowing you to fit more cotton and helps prevent over squonking, and the unique airflow system delivers stellar vapor and flavor. If you are searching for a new budget friendly RDA, then look no further. The Drop RDA is another collaboration, this time between Digiflavor and YouTuber The Vapor Chronicles. This is easily one of the best under $50 as the performance is second to none. There are a few key features that really set this one apart from the rest, and the first one is the build deck. It’s a raised four post deck, allowing you to go wild with your coil builds. You can either do one large single coil, a large dual coil build or even a quad coil build! The second key feature is the stepped airflow design. There are 10 airflow holes on each side, but are in a “T” shape, which allows for air to travel on the top, side and bottom of your coils. Like many new atomizers, this one is also compatible with 810 and 510 drip tips using the included drip tip. In addition, the Drop includes two 810 drip tips, one is acrylic and the other is Ultem. The Digiflavor Drop RDA is still one of the best atomizers available today, and will probably be well into 2019. Best of all, it can be found for well under the $50 mark! 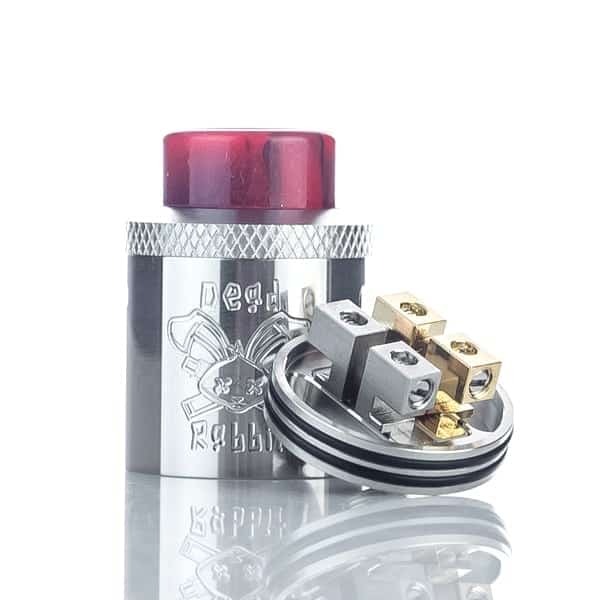 The Dead Rabbit RDA yet another collaboration that’s added to this list of top RDAs, this time being designed from the ground up by YouTuber Heathen and manufactured by Hellvape. This was one of our favorite RDAs that was released in 2017, and still has a spot in our personal top 10. The Hellvape x Heathen Dead Rabbit RDA features fully adjustable top airflow that is angled to allow airflow to travel under and then up the coil, ensuring excellent flavor. What’s even better, with this airflow design, you’ll expect no leaking whatsoever, which is great especially when squonking. The raised postless styled build deck allows for effortless building and installing of your coils. The Dead Rabbit does include a unique Resin drip tip, which is much preferred by many vapers. All in all, the Hellvape Dead Rabbit is another amazing atomizer that’ll fit the needs of many vapers. It performs well, minimizes leaking, easy to build on and more. If you enjoy single coil RDAs, be sure to check out the newer version, the Dead Rabbit SQ which is a single coil only variant. The YFTK Haku Phenom Style RDA is a clone of one of the most popular high end atomizers. The authentic Haku Phenom RDA is incredibly hard to get, and quite pricey. This Haku Clone offers similar performance and is of good quality. YFTK is pretty well known for offering great quality clone products as well. The Haku Phenom Clone features a single two post build deck, and offers adjustable airflow. However, this isn’t your standard side airflow as the airflow ports are angled, which allows for air to travel underneath and to the sides of the coil, providing solid flavor production. The included delrin drip tip allows for chain vaping at higher wattages since it’ll never get too hot. If you’re looking for one of the best clone RDAs, the YFTK Haku Phenom Style RDA is definitely one to consider. If you’re into customizing your atomizer, there are a variety of accessories available such as different color top caps and drip tips! Kindbright is another company who’s well known for making great quality clone RDAs. The 5A’s Basic RDA is another one of those high end atomizers many people want, but due to its price and availability, it’s hard to come by. 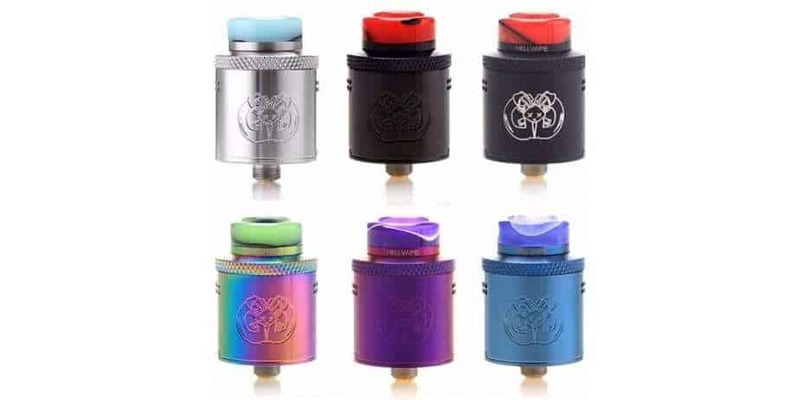 What makes the Basic RDA Clone unique is its airflow design. The airflow comes in from the top, but is redirected to the side; therefore hitting the coil on the side or bottom depending on coil position. With this type of design, it makes this RDA great for squonking since it minimizes the chances of any leaking. With its compact form factor, you’ll definitely experience flavorful clouds. 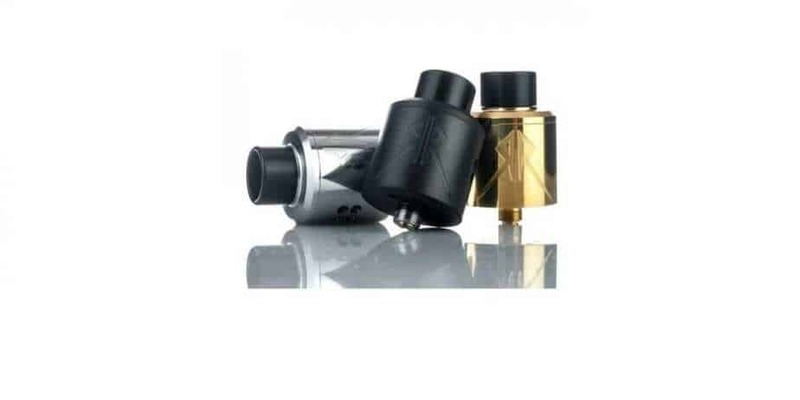 The Kindbright Basic Style RDA is available in two colors which are black or silver, and either includes an ultem drip tip. This is another great RDA clone to add to your vape collection if you’re into single coils, and flavor chasing. At under $15, it’s a no brainer. Firstly, RDA stands for rebuildable dripping atomizer. The key differences between this and other atomizers is that you have to build your own coils rather than something like a sub ohm tank which includes replacement coil heads and removes the need of building. Also, with an RDA, there isn’t any tank section where it stores e-liquid; therefore you will here the term “Drip” or “Dripping” a lot with this style of vape. Unlike a vape tank which houses multiple milliliters of e-juice, an RDA will require you to drip e-liquid onto your coils once they run dry. Not doing so, you will encounter something called a “Dry Hit”, which is something you want to avoid completely. One of the main reasons as to why many vapers prefer an RDA over any other atomizer is the flavor experience from them. The flavor that is produced from this style of vape is unlike any other. Your mouth is closer to your coils, and since your dripping e-juice directly onto them, your flavor will be through the roof and is a major advantage of RDAs. Another key benefit is that you’re able to install your own coils. With the wide variety of vape coils available today, you can easily find one to fit your preferences. Not to mention, exotic coil builds that can be either bought or made by you are constructed of multiple wires, which certainly adds to the flavor you’ll be getting. These are two of the main reasons to try an RDA. Some of the drawbacks of a rebuildable dripping atomizer is that, for one, you have to know how to build coils. In addition, it’s highly recommended to understand ohm’s law and battery safety since you’re in control of the resistance of the coils you build. Many newer vapers may not understand fully how to build, but once you do, it’s only natural you turn to drippers. Another drawback is that you have to constantly drip e-juice. However, since squonking is now mainstream in vaping, this pretty much eliminates this step since you can simply squonk e-juice into the build deck. Regardless, it’s still one of the drawbacks to consider when figuring out why to use an RDA. As shown in this article, there is a wide range of drippers available, and it might be tough to really figure out which one is right for you. For one, you have cloud RDAs vs Flavor RDAs, so if you’re into cloud chasing definitely try one of the atomizers recommended. However, if you’re into flavor chasing, then picking up a compact and flavor oriented drippers will be best for you. Then you have drippers with different types of airflow configurations. Bottom airflow atomizers tend to give the best flavor since the air is traveling under your coils while top airflow RDAs are great since they help prevent any leaking while bottom airflow atomizers are much more prone to that. Side airflow drippers kind of sit in the middle, chances of leaking are minimal, but you still get great flavor. Thankfully, there are some atomizers listed here that can mimic bottom airflow while prevent leaking, giving you the best of both worlds! In conclusion, we hope this article helps you in choosing the right RDA to fit your vaping needs. Nailing down the key features you want in your atomizer will help determine overall which is the best RDA for you. Great list. Thank you for all the awesome information.